The person I want to talk to is the person I am extremely shy to face now. I felt I jeopardize our future for taking a risk that is completely blurry at the moment. I feel embarrass because I am one who said that will keep everything intact until the desired amount is accumulated. He replied in a very understanding manner and I know he is sincere. I am really guilty about it. I am hoping that I can patch things up this next month and I am praying that everything will be worth the risk. My last post was two months ago. I was busy building audience for my beauty site while maintaining my general blog. I changed Spry Ardent Mulish to Ramble & Relish then dishysammy went live. Have you notice that I changed the layout of this blog too? Well I am looking for a place to vent. My SNS turned to be an open book now and I am not regretting the result. I still want to fulfill my dream of earning money through my blog. Many people were asking me if I am a makeup artist in the making but I answered them no. I really want to write. I am aiming to be every girls’ first aid when they need something in life. My makeup posts portrays that if we cannot hire a makeup artist to make us beautiful we can do it ourselves. My reviews on products give other consumers idea whether to buy or not. This is my space in the world wide web where I do not think the order of my words. Things just pop in and out my head. I just want to let it out. My tweets mentioned that I am feeling out of place now. TRUE!! Because now that I have two pregnant colleagues it seems that I am left behind because I cannot relate to their soon-to-be-mommy chit chats. Plus the issue of RH bill. Plus marriage talks in between. I do not want to be married and be pregnant now because I feel that I am in the right time where I can dictate where my career is leading. I will elaborate in my next post my point regarding the issues I mentioned above. For now I am just keeping my sanity. I hope you are enjoying my other blogs. Taking a break from my Boracay posts I still have one left; I will share my bf’s 24th birthday bash. He turned 24 last June 17 and we celebrated it the evening of 16th until dawn. I am sharing this to you because I was the one who prepared the food for the visitors of course with the help of his mom, sister, aunt, and their helper. This year was different because totally I haven’t planned anything. He just requested me to make lasagna but I ended up cooking almost everything. Since I was the one in charge I didn’t have time to document the whole process and results of my “catering” but some friends captured it. I finished cooking everything around 9pm I guess and I was never hungry. And for the main event and my only surprise for the night (which he already trolled because he entered the kitchen when I was about to brought the cake out). My friend AJ made this ‘Like a Sir"’ cupcakes. Forgive my handwriting readers and the photo bum at the back I am excited for our baking session but Tools and ingredients are too expensive you know. Oh well let’s go to my sentiments…. I am totally not complaining that I made this for him. Some said that I made myself a maid for that day and I should have cooked the Lasagna at home and arrived at their house astonishing. Although my arms, my legs, and back hurt that night, doing this for him makes me happy. Living one a day at time with this person makes the future nonetheless clearer that even though I don’t have bold plans about us I see myself doing this for the rest of my life. Plus the vision of what I want (I stated in my Facebook status) is to become a good example to my daughter someday – A good wife and a mother. He is now in Singapore to attend the Broadcast Asia 2012 and will be back on Thursday. It was also Father’s Day that day so belated Happy Father’s Day to all daddy’s in the world. I will write a post blog regarding Father’s Day. 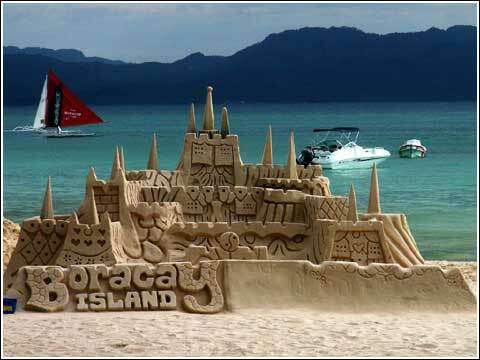 I am bound to Boracay Today. This is a queued post so maybe by the time you read this I am on the plane or just landed. My flight is 0600H very early via Cebu Pacific. Positive Vibes for delayed and cancelled flights, may they stay away from us. I will be with BF and his family. yey! So excited to blog my experience to you. Will update everyone when I get back. P.S. Photo courtesy of Google images. Yellow Wednesday, driving in EDSA will never be easy…. Today I am wearing a very cute dress with a very cute print. I got this from Get Laud. My best friend forced me to buy this. LOL I am just kidding. I am not in uniform because I have 6 am driving class (main road driving), which I will discuss in a while and a birthday gathering to attend. Let’s go back to the Driving 101. I am also having issues using different types of car. I was using a wagon last Sunday and back to sedan today. Each car have different pedals and I can’t foresee how should I step on the clutch, brakes, and gas. They say I will learn someday, I just have to incorporate it in my system like breathing. Since I am just starting I hope one day I could get use to it. Practice makes perfect right. But I am sure everyday will be a practice because each day road situation varies. I will not be dealing with same cars and same situation. I am not losing hope on this. I still have seven more hours to master driving. I had a good night sleep by the way, maybe I was just paranoid about my grandma’s death and I thought she’s everywhere. Also I have something in mind now that I want to pursue but I need a booster, I know I can do that. I hope I can stop procrastinating and do it right away. Oh I am running out of words to say so I am just going to back blog on my food trips. Visit my other blog here and show me some love. My Manic Monday: Are ghosts true? It’s still a good day though despite. I was asked to write for an inspirational speech which I do not have any idea about, but hey I was still able to do it. I just didn’t like the idea how the task was given to me. I am writing because I am having hard time sleeping. Do you believe in ghosts? Nine days? Forty days? and other beliefs on death on you relative. We celebrated the ninth day of my grand mother yesterday and just when we finished praying the rosary and novena the light went off. Just before this event happened, I heard her cleared her throat around 4:30 am and I can’t barely sleep. This my third encounter on these things. What do you know about third eyes? I am hoping to get a good night sleep tonight. As fright is not worth my eye bags. After seeing my doctor couple of weeks ago and took the medicine she prescribe…. it’d work… not permanently I still have to come back for series of tests and I a hoping science can do something about my situation and this is not that serious. I need to be okay about this matter as I want to create a blog in the future about Motherhood. Did I intrigued you in some way? My Firmoo Glasses arrived, just in time for my Boracay trip this Saturday. I hope it will not rain that much so I can use this. I will write my review as soon as get back (so that I have good photos too) I am wondering how the customer support knew that I love the color purple. VERY SMART! I decided to start all over again cause back blogging seems very hard. I would like to thank Windows Live Writer for easier life they gave me in managing my blog. So much for my Monday. P.S. I hade my lashes extended for the second time. This time only 8mm the 10mm I had two years ago was way too over the top.